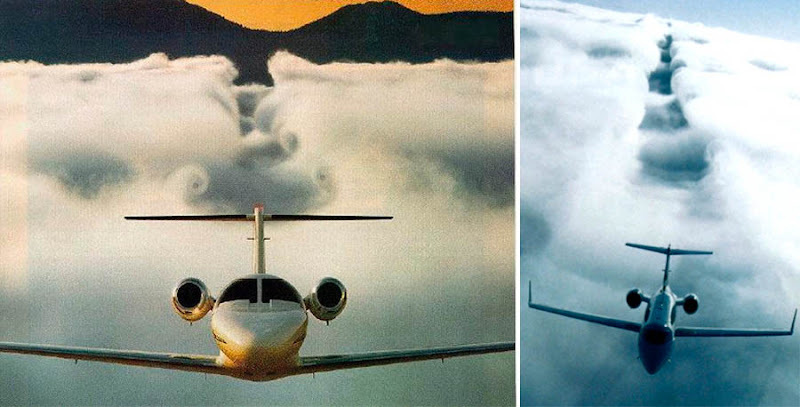 Fluid dynamics, turbulence, refraction combine to create spectacular sky shows! 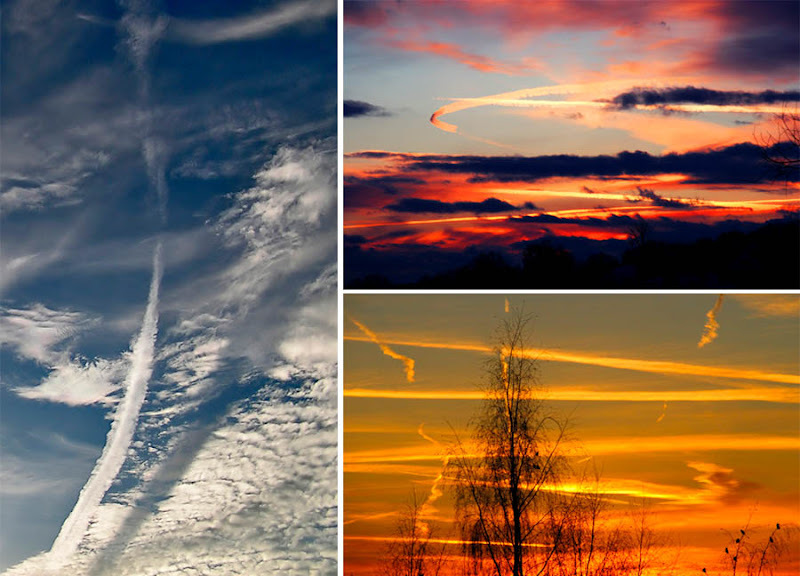 More and more high-altitude vapour trails appear in our skies as the flight density of commercial aviation increases. 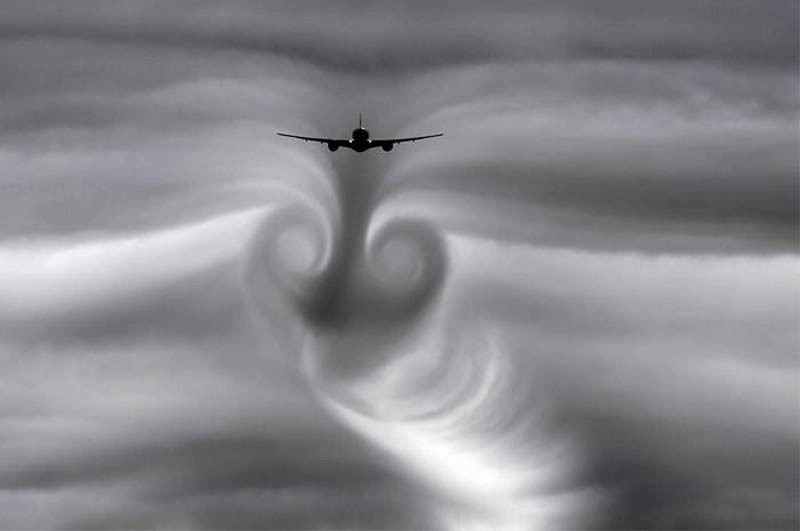 These trails often follow the plane straight and narrow, then degrade into fuzzy and fanciful formations, blending with clouds and leaving a subtle afterimage in our subconscious. We almost do not notice them any more! 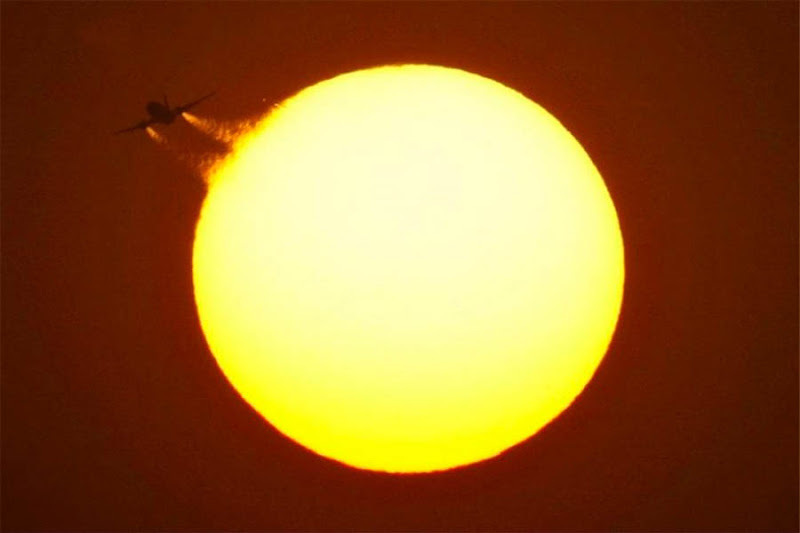 But as the following photos show, sometimes a simple condensation trail from a jet engine can be worth a second glance. 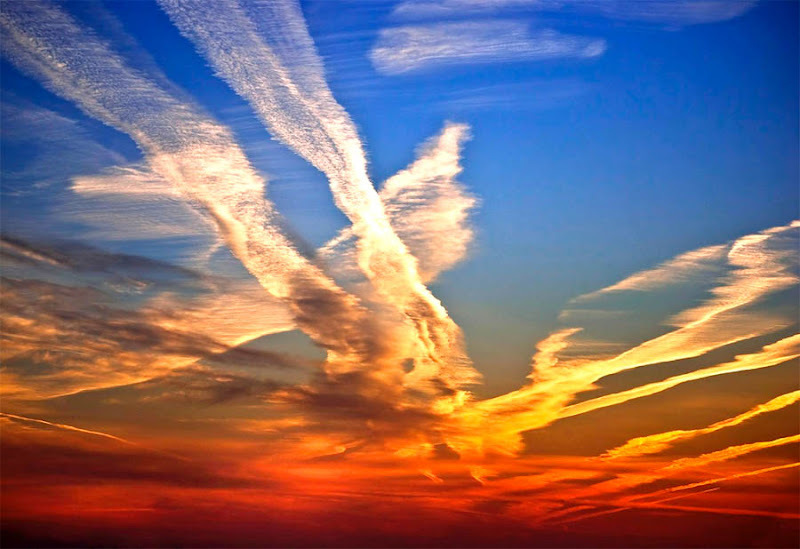 Contrails, also called "Chemtrails" or "Vapor Trails", are usually forming at high altitudes and consist of tiny ice crystals, or water droplets. 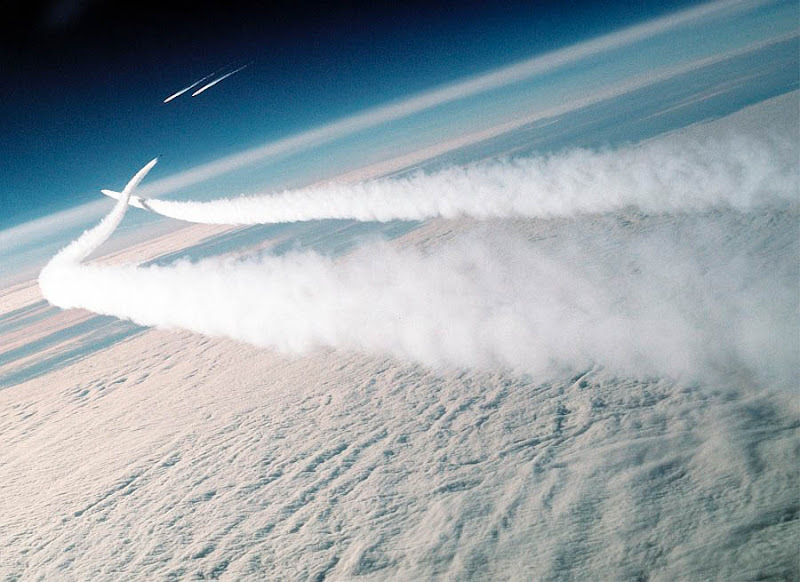 The sort of contrails generated by engine exhaust would, of course, contribute to pollution (here is an interesting discussion on the topic), but the visible white streams in the sky (often combined with airplane's "wingtip vortices") are essentially ice crystals and pure condensation trails. "Being composed of water, they are not, in and of themselves, air pollution." 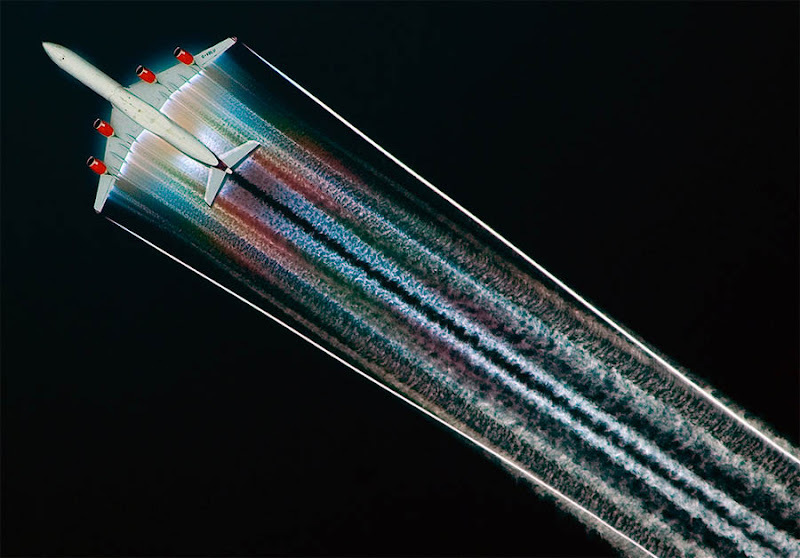 There are other types of contrails besides those from the engine exhaust. 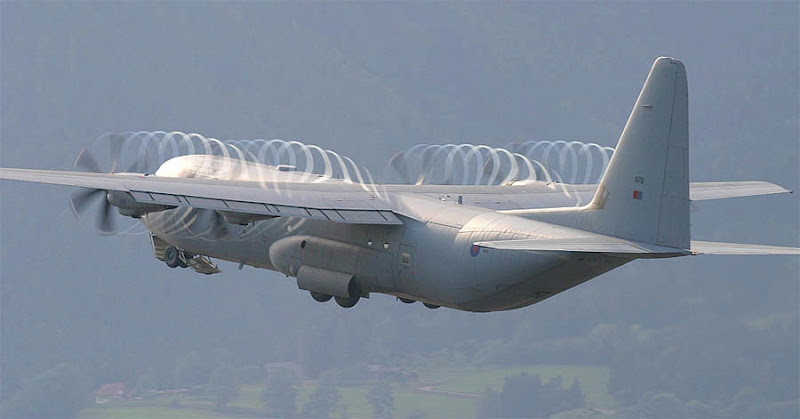 Our reader writes: "I've seen and taken pictures of propeller-driven aircraft with contrails forming off the prop tips and wrapping themselves around the fuselage and nacelles of the aircraft for five or six spirals from the front of the aircraft/nacelle. This is usually in high ambient temperature/high humidity conditions." 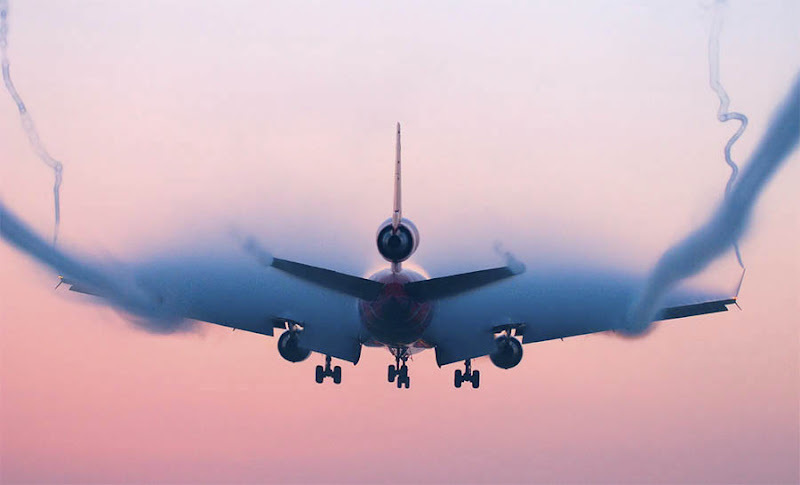 Going over the sound barrier leads to one of the most amazing condensation effects: so called "Prandtl-Glauert Condensation Clouds" caused by the rapid cooling of the air. You have to be really quick with your camera to capture it, as it only occurs at the exact moment of crossing the sonic barrier. 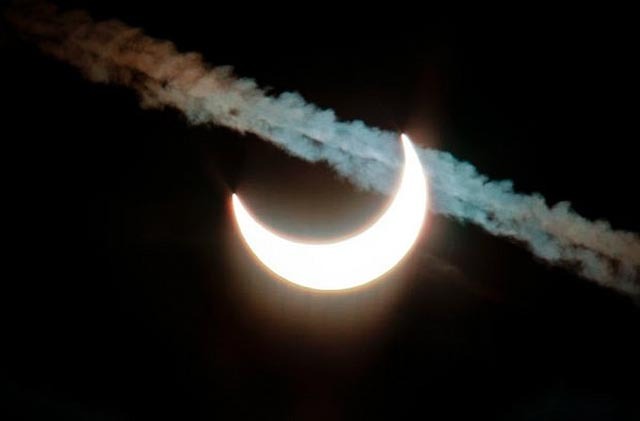 This page has many photographs and videos of this phenomena. 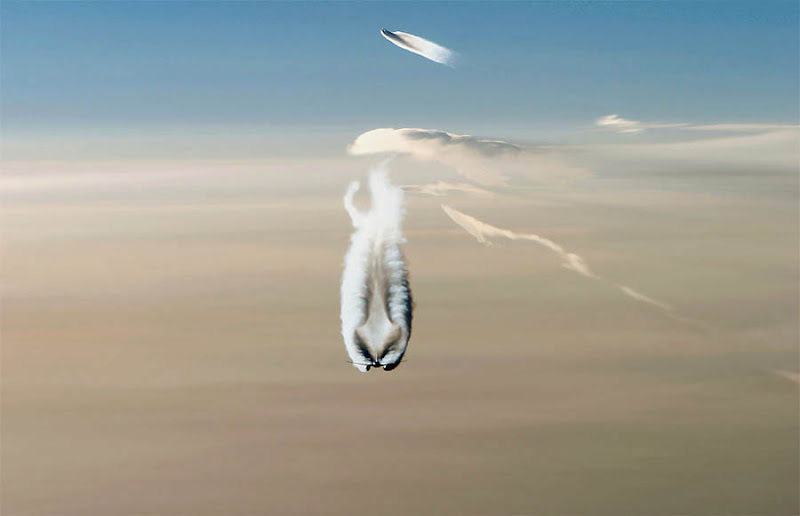 Our reader Ian Woolard comments on this effect: "These weird clouds occur when the aircraft is moving at transonic speed - these are from about Mach 0.8 to Mach 1.2, and I suspect that none of these aircraft are actually going faster than Mach 1.0. 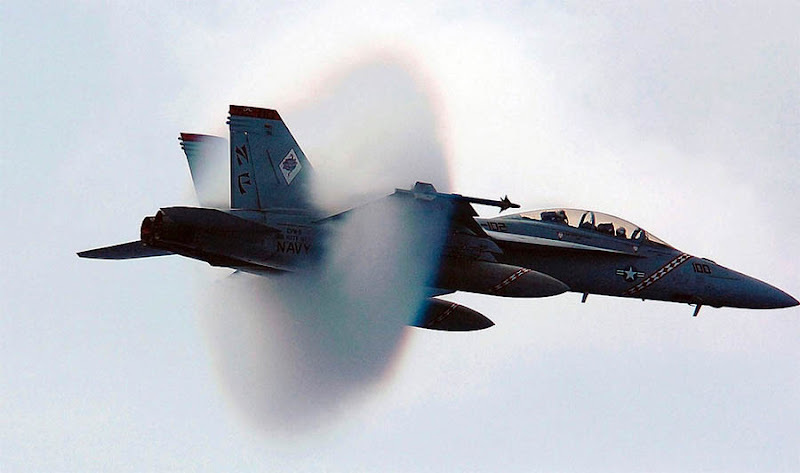 There is a reason for this: the shapes are caused where the air is "temporarily" forced to speed up past the aircraft to supersonic speeds, but since the aircraft is moving below the speed of sound, no sonic boom reaches the ground." There is a plane at the end of this rainbow! 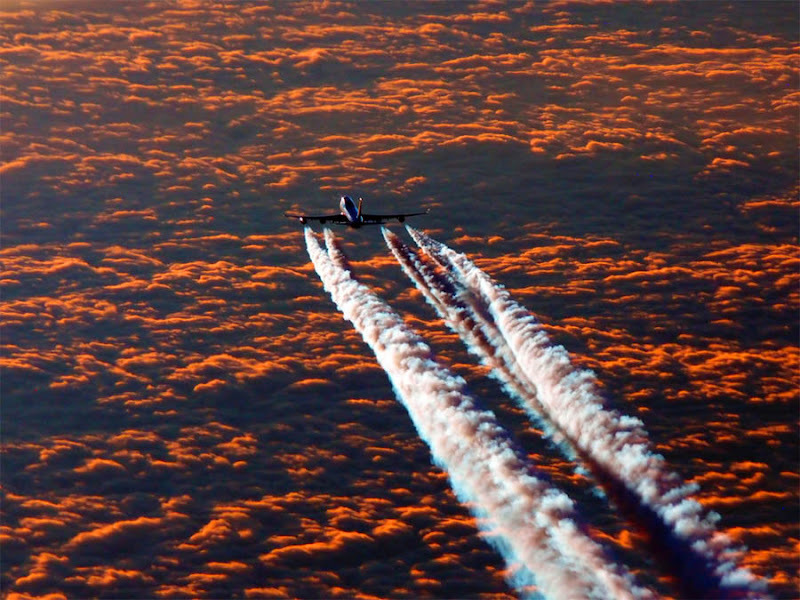 Send us your own photographs of jet trails and cloudscapes, that you took during a long flight, perhaps, just to pass the time... or any other unique high-altitude shots that you had opportunity to capture. 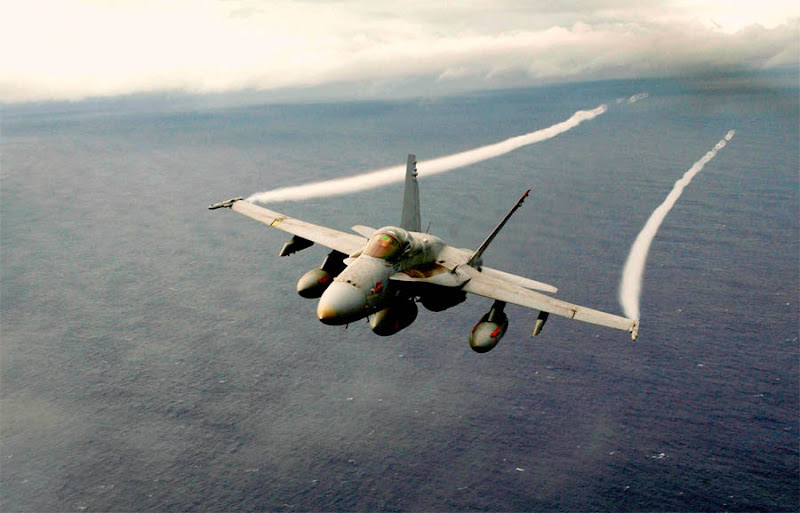 "F/A-18F Super Hornet completes a super-sonic flyby:"
To me it seems to be the F-14? At least definately no Super-Hornet. First of all, your blog is very good. 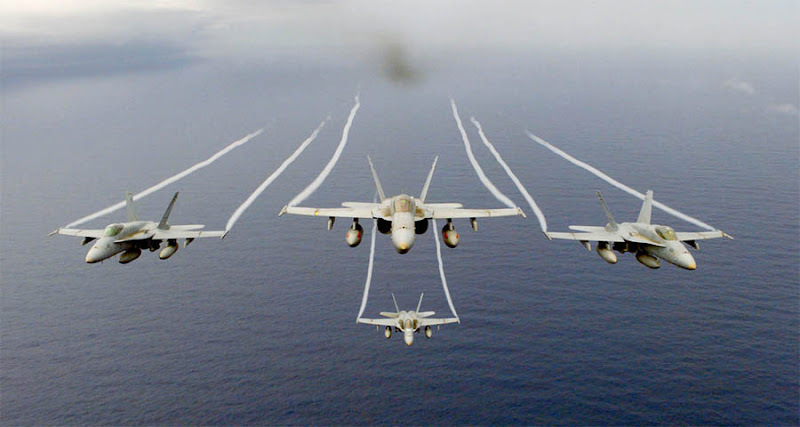 It´s not a F-18 super hornet. 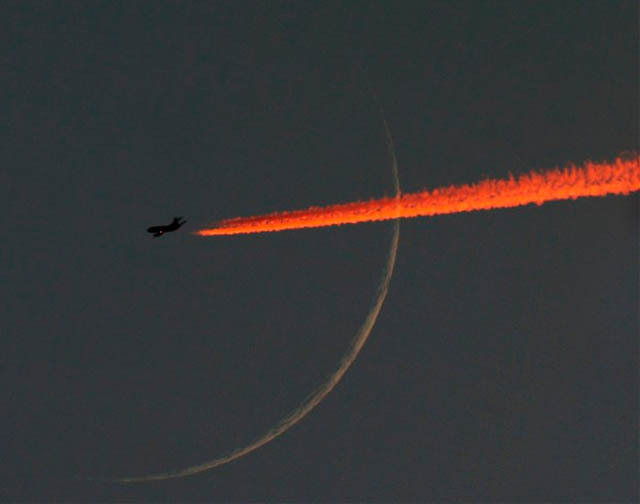 It´s a F-14 (wacth the rest of the photos, the diference is noticeable), and there is an aditional reason for the vapor contrail: at certain altitude there are air zones of very low temperature (-X ºC), so the condensation is another reason. Hey guys, thank you for correction! .. Sharp eye! 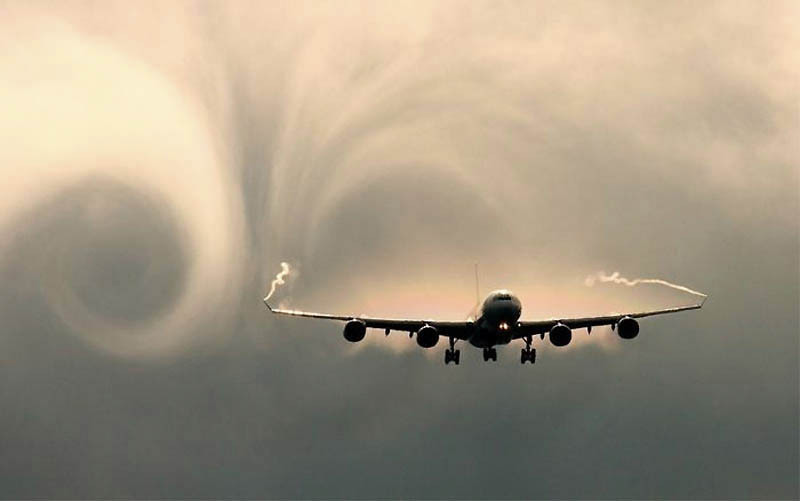 Contrails have nothing to do with vortices from the wing tips. 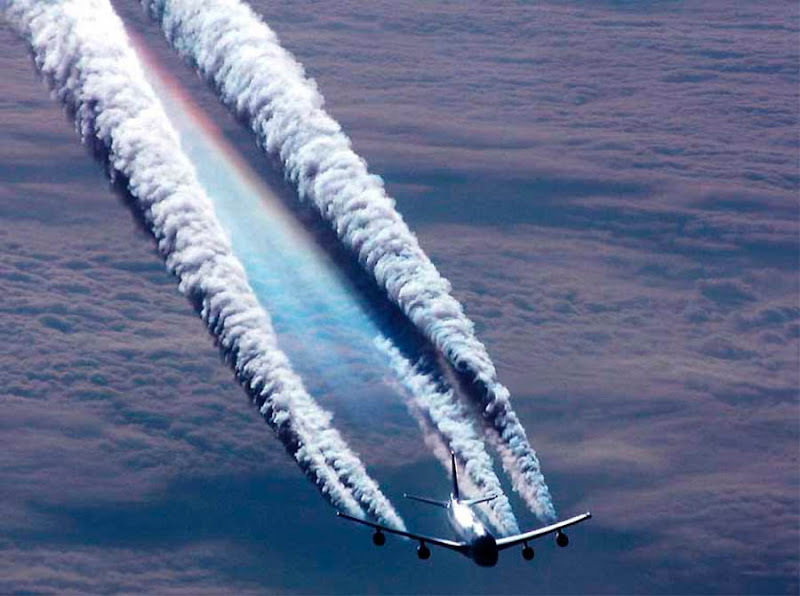 They are formed from the water vapor in the engine exhaust. 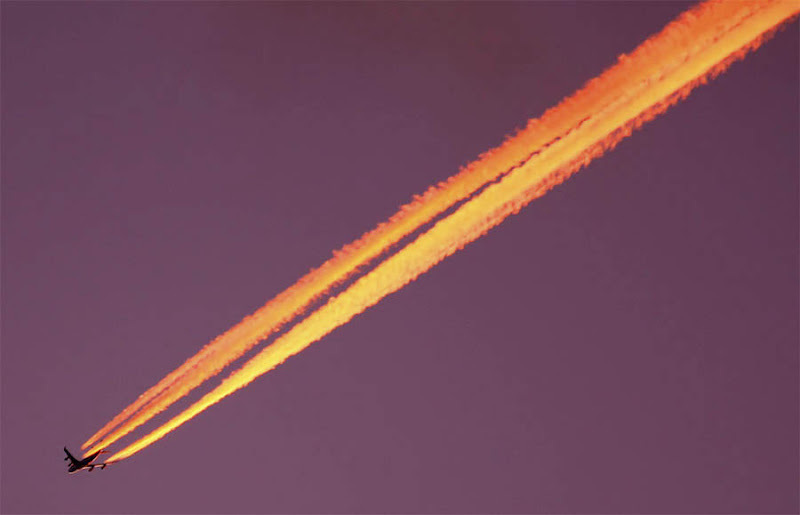 If it were from the wingtips, all planes would produce the same number of contrails. Coincidentally, it is always the same as the number of engines. SST-PR-1 was on my NETWORK, I had a some type of super JET in my area. We will have lots of clouds in our are, looking like rain any second. Then comes these jets and the clouds dry up and NO RAIN. Perhaps our government is looking for a way to control the atmosphere. SST-PR-1 was on my NETWORK, at the same time I noticed some type of super jet in my area. 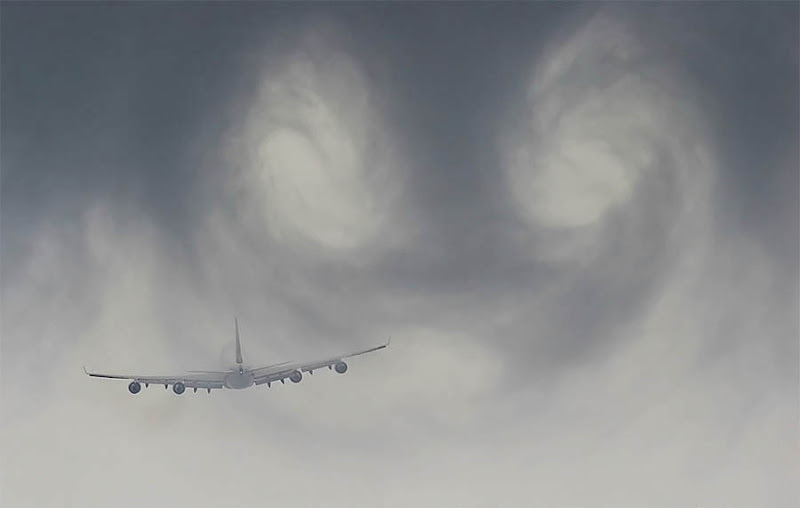 It looked as if it was about to rain, then these jets came by and it seemed like all the clouds disappeared. 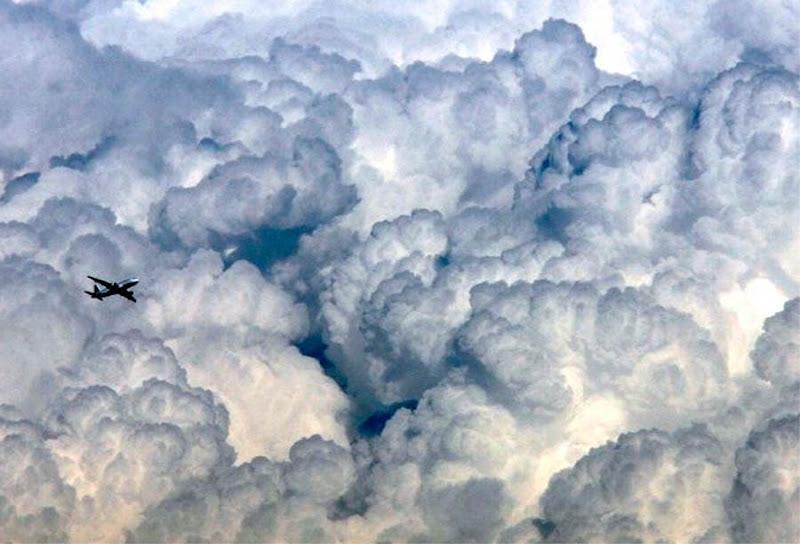 Could our airforce be training to control our weather? PS. I live in Augusta Georgia next to the airport where this seems to be happening all the time. Looks like we are going to have a down pour then "JETS" and nothing, could they be seeding and unseeding the clouds. 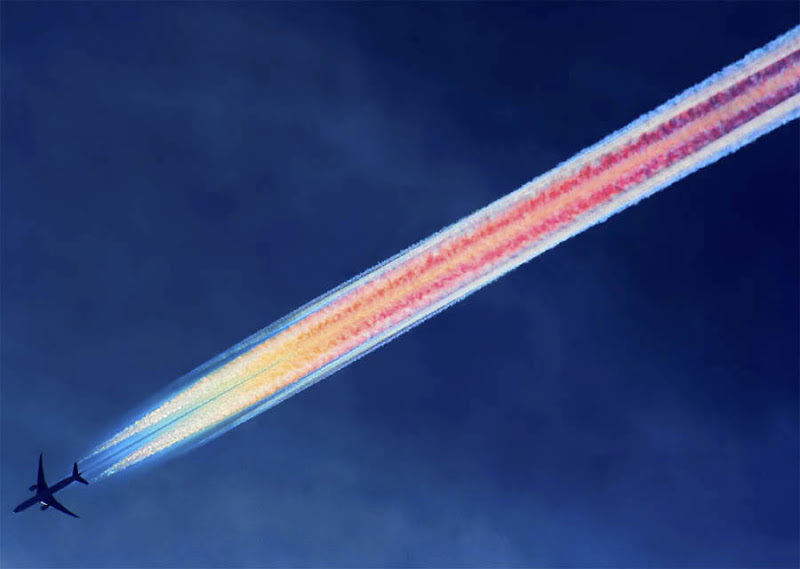 What's up with this chemtrail thing? 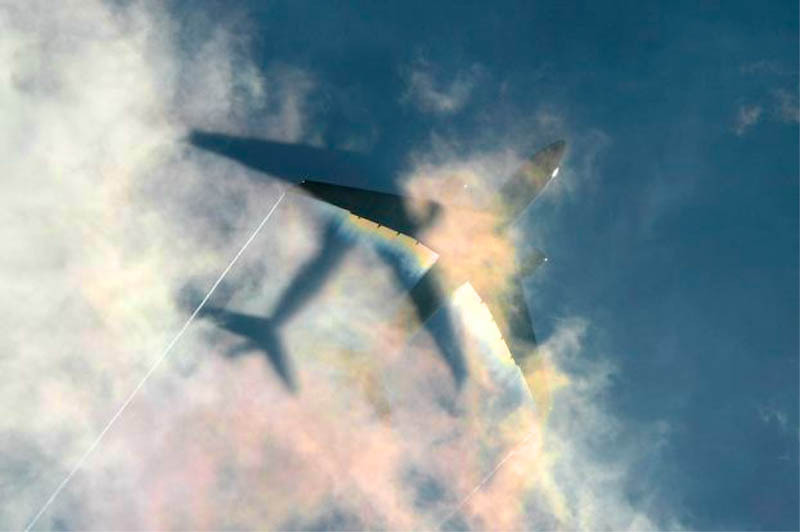 There are other types of contrails besides those from the engine exhaust. 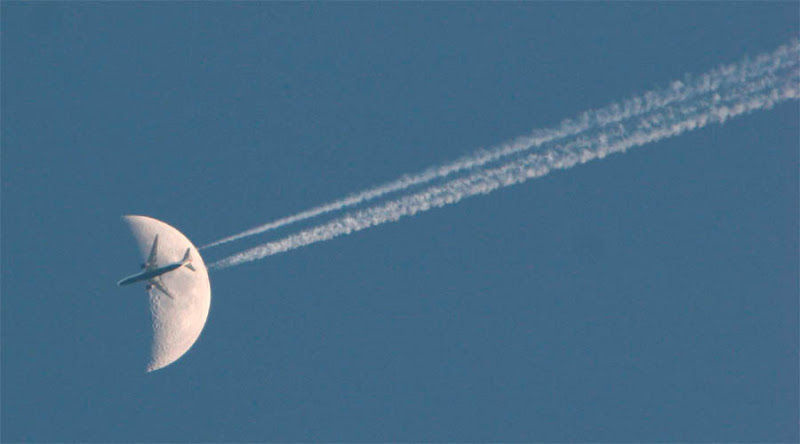 I've seen and taken pictures of propeller driven aircraft with contrails forming off the prop tips and wrapping themselves around the fuselage and nacelles of the aircraft for five or six spirals from the front of the aircraft/nacelle. This is usually in high ambient temperature/high humidity conditions. I've also seen a number of pictures of contrails forming off the wingtips of aircraft pulling g's, also in high temp/humid conditions. Just wanted to share. In reply to the people thinking the fly-by is an f-14. It is in fact an F/A-18. The very distinct detail of the wings is clearly a super hornet. The wings in the photo are inable of sweeping as the f-14 can. Look at the wing shape.